The Navman iCN 510 is a sleek, pocket sized, mobile GPS navigation solution delivering outstanding performance, whether using in-car, or on foot. Driven by Navman SmartST Version 3 software, the Navman iCN 510 is packed with superb features including 3D map view, voice guidance, postcode search, Back-on-Track rerouting, 'Avoid Areas' so you can avoid the traffic 'hotspots', and customisable points of interest. Navman iCN 510 has been discontinued. Accessories, spares and parts are still available for your iCN 510. The Navman iCN 510 high-resolution touch-screen, allows you to simply enter an address, point of interest or enter a destination directly by selecting a 5 character postcode search. Route calculation can then be made to avoid user selected areas. The Navman iCN 510 uses the latest maps from TeleAtlas map data, with street level maps of the UK preinstalled on the memory card. When using in mainland Europe, the Navman iCN 510 provides continuous navigation from one European city to the another via major roads. The Navman iCN 510 is additionally powered by a built-in Li-ion battery this makes the Navman iCN 510 ideal for handheld operation as well as in-car via the 12-24 volt cigarette lighter adaptor. The Navman iCN 510 is thus ideal for in-car, marine and on-foot navigation. The Navman iCN 510 has been designed to be a fully portable navigation system, and as such can be transferred from vehicle to vehicle with ease by the user. The Navman iCN 510 is complete with a vehicle windscreen mounting bracket. In addition the Navman iCN 510 can also be powered by the provided mains A/C power adaptor for use in the home or office, when updating map detail or configuring a route. 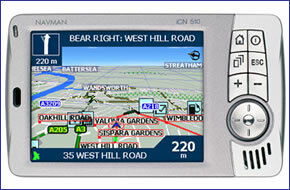 The Navman iCN 510 works with Tele Atlas Maps to provide detailed maps of the UK. Tele Atlas Maps provide high quality, detail rich maps, which in addition to street information include features such as route calculation, Points of Interest, Estimated Time of Arrival, and more. Further Navman iCN 510 maps are available SD card which insert directly into the Navman iCN 510. Available Navman iCN 510 maps include, Western Europe, North America, Australia and New Zealand. View the complete range of maps available for the Navman iCN 510. Although the Navman iCN 510 has been discontinued, a number of accessories are still available to buy from ActiveGPS. These accessories and spares include: black protective case, windscreen mounting bracket, remote control and external GPS antenna. Question: I have a navman ice 510 version 3.0. Can I still buy a power adapter for my car, if so can I buy one? Answer: The Navman iCN 510 car charger is no longer available, having been discontinued by Navman. The current range of Navman iCN 510 accessories can be viewed and purchased online here. Do you have a question about the Navman iCN 510? Submit your question via our contact page.